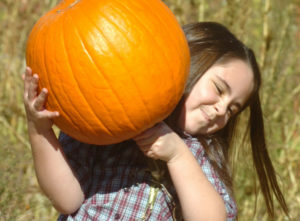 Have children write their estimates of the pumpkin’s weight on a slip of paper. Kids write their names on the paper, fold them, and place in a box. 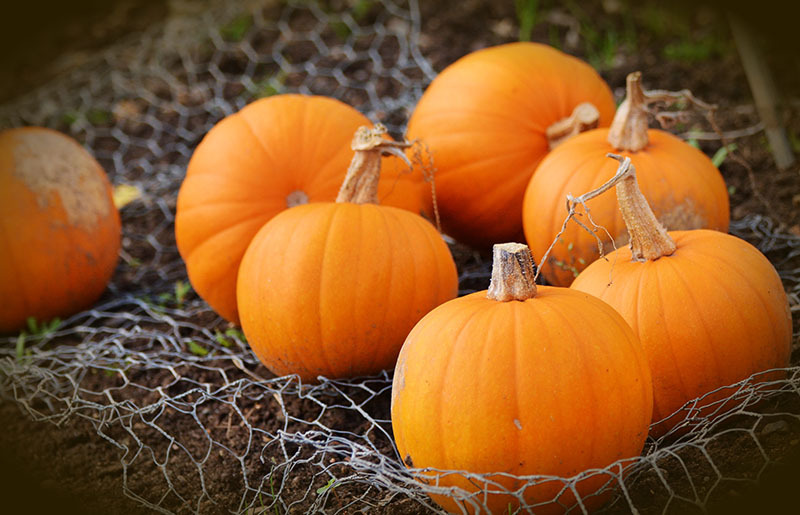 At the end of the time-frame, weigh the pumpkin and award a prize or give the pumpkin to the child with the closest guess. 1. Help children cut the fruit and vegetables into small pieces and place on paper plates. 2. Ask children to observe and comment on the differences and similarities of texture, color, size, shape. etc. 3. Give each child a paper plate. Let them select from the variety of foods to taste. Encourage children to tasted the unfamiliar as well as favorites. 4. Have a discussion after the tasting party. Talk about how they look, taste, smell and feel. Encourage the use of such words as sweet, sour, bumpy, smooth and so on. YOU CAN ALSO ADD OTHER AUTUMN ITEMS such as canned pumpkin and cranberry sauce, nuts, acorns, pine-cones, cranberries, bark, corn, stones, grass and sticks. etc. Pumpkins are fun. A pumpkin (watermelon too) will float because its mass is less than the mass of water it displaces. This is due primarily because the inside of the pumpkin and melon are hollow. It is mostly air, which has a much lower mass than water. Cut the top off the pumpkin and clean out the seeds. Paint a face on the pumpkin if it is Halloween project. If it is for Fall/Autumn, leave it natural. Rinse pumpkin seeds. Remove all the pulp. Drain the seeds and discard the pulp. Spread out on paper towel on a cookie sheet and dry them over-night. Place butter or Olive Oil in a microwave-safe, baking dish. Place the Indian Corn on its side in rectangular baking dish or similar container. Put water in to cover the bottom of dish and then place it in a sunny spot. The corn will sprout in about a week. A good idea to provide a magnifying glass for close inspection. As corn sprouts some of the kernels fall of…this activity gives children a chance to handle and closely observe the sprouting corn. Kids like this one! SPROUTING POPCORN KERNEL- Place dirt in a small zip lock bag. Add water and a few kernels of popcorn. Seal the bag and hang in sunny window. The popcorn kernels will begin to sprout in about a week. With the approach of fall, now is the time to get those bulbs in the ground for spring blossoms such as tulips, hyacinths, daffodils and lilies. When flowers welcome next spring-you’ll be happy that you did! In the cold weather- birds, squirrels and other small wildlife are in constant search of food, fresh water and safe shelter. Set up a bird feeder, bird bath and bird house where you and the children will be able to quietly observe. Youth enjoy watching different animals seek the food and water and your bird house will be there when needed. Turn the garden into a bird-feeding haven for the fall. FYI: In a warm temperate climate sunflowers grow from seed to flowering stage in about three months –and another six weeks until the seeds mature in the flower head. This relates to the giant flowering types-some of the smaller varieties are quicker to mature. Find: Twigs, leaves, small pine cones, nuts, etc. Glue them onto tag board cut into wreath shape (or any design). This shows children how to collect items from the ground without damaging the environment. You can also peel off the backing of contact paper and adhere the nature items to the sticky side. Cut cardboard and frame either method. FALL IS THE TIME to collect the leaves, pine cones, seeds, sticks, etc. for your craft projects for Fall and Winter! Gather all you can…You’ll be glad that you did! 1. Wrap a piece of masking tape (sticky side out) around each child’s wrist. Go on a nature walk and have children collect a leaf from each of several trees—sticking it on their leaf bracelet. 2. Get a Book with a variety of leaves to compare “finds” when you return. 3. will also be able to go home and see what leaves they find there! As shown, you can take clear packing tape and make bracelets with a variey of nature finds–as well as some wonderful bookmarks! Photographs are courtesy of Angela at Colorfool blogsite…Thank you Angela! Angela shares that flat items adhere better than bulky. You may also want to check the Fall Art and Craft Category There are many ideas using nature items of leaves, seeds, etc. IF YOU FIND A CATERILLAR in late summer to late fall, put fresh leaves in a tank or fish bowl with a few twigs on which to make a chrysalis. FALL SCIENCE AND NATURE FUN WITH APPLES! GUESS THE NUMBER OF SEEDS IN AN APPLE! You can also turn the above into a contest, by LEAVING THE APPLE OUT…HAVE THE CHILDREN GUESS THE NUMBER OF SEEDS in the apple—- and then put their guesses in a container. After all have guessed—proceed as above. Bring in LARGE VARIETY of apples. (During peek season there are many-many!) Have children taste them and see which one they like the best. With older kids you can chart and tally the results. You can also do this with applesauce (flavored vs. unflavored and also taste test cider vs. apple juice. Have each child’s name written down the left hand margin. Click here for tons of ‘Apple Fun’ Ideas…Games, Art, Crafts, Snacks, and so much more!